Last weekend I visited a Chick-fil-A with my family. The place was packed, but we ordered and found a corner booth with enough room for seven. He returned a 30 seconds later with Chick-fil-A sauce. Since this was our first visit to a Chick-fil-A we had no idea such sauce existed. And yes, it was good. The kids dipped their chicken and waffle fries in the sauce and skipped the ketchup. A few minutes later the same man asked if he could refill our drinks. He also brought over a stack of napkins and was friendly without being annoying. I expect this level of service at an upscale restaurant, but not a fast food joint where I can feed the family for under 35 bucks. As we got up to leave, my son accidentally dumped his extra fries in the trash bin. This same man offered to replace them at no charge. When he saw me approach the exit with a car-seat over my shoulder, he stepped ahead of me and opened the door. Is this just the norm for Chick-fil-A? I don’t know, but I was so impressed I stepped back into the lobby while Kim gathered the kids. I wanted to find out what this man’s job title is. “I’m very impressed with the service here,” I told him. “What’s your job title?” I asked. “My job is to make sure customers leave happy,” he replied before heading off to assist someone else. I never did find out what his official job title is, but I guess that doesn’t matter. The fact is he made our visit a lot more comfortable and even, I dare say, memorable. With five young children, we’ve been on the flip side of this experience where our patronage wasn’t appreciated because our kids were acting like kids. Don’t you love that stare some servers give you when your child can’t decide between the fries, fruit cup, or carrot sticks? Oh how I love that! Anyway, this experience reset my expectations of what a fast food experience can be. Do you have someone at your company whose job it is to make sure customers leave happy? If not, should you? You can really set your business and products apart from the competition especially if you’re in a market where the bar for service has been set low. I took two kids to Supercuts today. I sat on the empty couch and opened up Reeder on my iPhone to get caught up on my favorite blogs while the stylists went to work. And then the next song began. I couldn’t believe what I’d just heard. Was Supercuts so tacky that they send reminders to tip over their speaker system? I turned around to look at the stylists working on my kids. They must hear this dozens of times each day, but have probably tuned it out by now. If I were a stylist at Supercuts I’d be embarrassed. Supercuts headquarters must believe some people need a public reminder to tip. But they offend the rest of us who don’t need a reminder. Let us decide if the service we received is tip-worthy. This isn’t a restaurant where tips make up a good portion of a server’s wage. Maybe Supercuts could take it a step further and just tell us how much to tip. Being told to tip takes the joy out of the act. And it feels wrong and almost subliminal given how quickly the message was delivered between songs. Is this really as tacky as it appeared to me today or am I overreacting? One afternoon a representative from Smith Brothers Farms knocked on our door and asked if we’d be interested in having milk delivered to our home. We’ve never done this before, but make several unplanned trips to the grocery store each week to purchase milk, so it seemed like a good idea. Kim signed up on the spot. A few days later a small milk cooler showed up on our porch which lead to our kids calling dibs on who would be the first to retrieve the milk. Thursday morning rolled around, and the kids were up before the milk arrived . 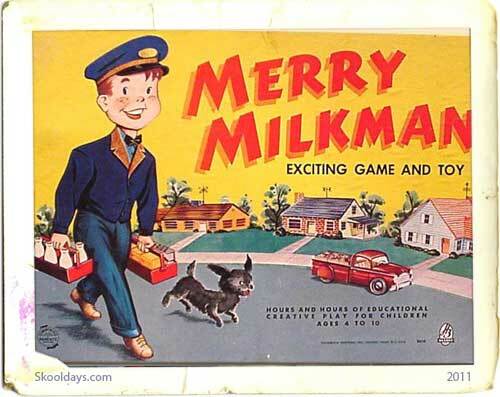 It wasn’t long before our milk man slipped four half gallons into our cooler. That was a few weeks ago and we’ve enjoyed having fresh milk in our home which has resulted in fewer trips to the store. The milk costs a bit more, but it tastes better. Their website touts, “from the cows to your table within 24 to 48 hours” and I believe it. But as much as our kids have enjoyed the Thursday morning excitement, and we’ve enjoyed the quality of milk, that’s not what made this local business stand out. What impressed me most was hand written note that arrived before our first order. It wasn’t written on corporate letterhead, and it certainly wasn’t written by a PR department, nor did it contain the typical corp-speak that says everything but means nothing. Instead the note included a list of items we ordered and the day and time we should expect them. He thanked us for supporting his business and signed his name. No list of products. No upsell. No corporate approved title or signature in place of his first name. This is a business that stands out not because they do one big thing. No, instead they have made many small decisions that add up to something memorable. Compare this to hundreds of letters I receive each year from DirecTV, Comcast, & AT&T promising me the world if only I’ll send them a few more bucks each month. Some will say this personalized business model does not scale. Why not just have a computer send a confirmation slip by mail? Wouldn’t that do the job and cost less? It would and it wouldn’t. Both groups eventually find what they’re after. But I’m left to wonder if either group is happy with their purchase. For example, tell a group of coworkers you purchased a new car and wait for the stories to roll in. Someone has a friend who would have found it cheaper. Why didn’t you use Craigslist, eBay, Cheapcarsforsuckers.com? Man, I hope you checked Consumer Reports! If you didn’t see the invoice, you paid too much. It’s a race to the bottom. No matter what you paid, someone paid less. Or bargained harder for or had a secret offer code. But buying the fastest or most expensive isn’t much better. I speak with people who want the most expensive processor or video card. Surely the most expensive golf clubs, vacuum or iPhone case is the best, right? These people are happy, but only until a newer model arrives. If you equate “best” with “most expensive” any positive feelings towards the product comes with an expiration date. How often do we search for the cheapest? Or the best reviewed? Or the one with the most Amazon comments? Maybe we should be asking ourselves, “What do I need?” instead. Since we moved to Auburn six years ago, we’ve spent more money at Fred Meyer than anywhere else. More than Trader Joes and Costco combined. I estimate we spend about $800/month at Fred Meyer. I continue to shop there although there are an Albertsons and Safeway close by. But over the past few months Fred Meyer has been under construction. That means products have been moved around to make room fixtures. A shopping trip that took 30 minutes can now take twice as long. Last week a construction worker was using the sledge hammer just feet away from the entrance while the store was still open. My ears were ringing so much that I cut my trip short and told Kim was getting close to trying another store. I’ve remained loyal to Fred Meyer because I knew the construction would eventually end, and I’ve been treated well over the years. My only real complaint up until now has been the gauntlet of employees on break who smoke too close to the entrance. I’m certain I’m not alone when I say I don’t appreciate walking through a cloud of cigarette smoke as I enter the store. Kim recently purchased a couple of small containers of spreadable butter and some whole grain bread. When Kim opened the butter yesterday it was moldy. In fact, both containers were moldy. And today, we realized the bread had mold spots all over it. We tossed all it in the garbage. The three items total about $10. When I went shopping tonight, I decided to stop by customer service because I knew they could look up our purchases by our Fred Meyer rewards card. I explained the situation to Jacqueline who began by searching for the items on my rewards card. I explained the items were on Kim’s card and gave her our phone number to begin the search. My days of shopping at Fred Meyer are over too. I decided it was time to walk away. I understand that corporations have policies. Jacqueline and Bobby don’t set those policies. They are merely trained to carry them out. What disappointed me most about the encounter tonight isn’t that I’m out ten bucks worth of food, but that my six years of business with Fred Meyer apparently means nothing to them. I left the store and drove to Safeway where I purchased the $50 worth of items I’d put back at Fred Meyer. A few items were more expensive, but I didn’t mind because I didn’t smell like an ashtray as I rolled my cart up and down the aisles. Update #1: I received an email this morning from @Fred_Meyer on Twitter asking for my contact information. I was told the store director would contact me. Also, the manager of the Auburn Fred Meyer sent me an email. He apologized and asked when we could speak. Update #2: I met with the manager. He apologized and took the time to listen to my concerns. He was professional and sympathetic. He walked with me around the store to gather the items that went bad. He placed them in a bag, along with a gift card, and told me that hoped I’d return some day. I was also contacted by Bobby who apologized and also sent me a gift card. I’ve been impressed with the fact that Fred Meyer contacted me the day after I first posted my experience. They went well above what I expected. Is it possible to purchase an item over the internet without being bombarded with spam? I’m beginning to wonder after staying at a Best Western for two nights. When I called the Best Western reservation line, I was able to reserve a room on short notice. After giving the man my information including my credit card, he asked for my email address and said that’s where he’d send my confirmation number. Everything about our stay went smoothly. The rooms were clean and the staff was polite. Kim and I both mentioned that we’d consider staying at Best Western the next time we took a family vacation. We checked out of our room and made our way back to Seattle, and that’s when the emails started. The first few emails asked me to click on a link to provide feedback about our stay. I don’t typically leave feedback unless someone went above and beyond their job, and I do so in order to call out that specific employee by name. If I have a problem with service, I’ll ask to speak with a manager to see if we can solve it directly. Our stay with Best Western was good, but I didn’t experience anything so memorable that I felt it worth ten minutes of my time to fill out a feedback form. So I deleted the emails. But the next day more emails arrived, with ever more urgent wording. Ok, so I created the last one but that’s how I felt. I then began to receive special offer emails from Best Western. In tiny print, at the bottom of each email, was a link to update my subscription settings. Since when did I subscribe to anything? I tried to remove myself from all mailings but that clearly didn’t work. The wording on those things is so convoluted that I’m sure that’s the point of the whole exercise. Make it easy to sign up but impossible to leave. Of course, they never mention how many past customers will take their money elsewhere next time because of those very emails. What started out as a pleasant stay with Best Western has turned into a negative reminder each time I delete their spam from my inbox. Maybe Best Western got suckered into a client loyalty program, but their actions are incredibly short-sighted. Sure, send out one request for feedback, but that’s it. Don’t send a reminder when I don’t fill it out within 24 hours. And certainly don’t continue to barrage me with special offer emails. You ruined a good thing, Best Western. I have choices when it comes to affordable lodging and I’ll vote with my wallet. That’s how my morning started at the urgent care facility. What began as a sore throat grew into a sinus infection, and I needed to get on antibiotics. I showed up at 7:30 this morning and finally saw a doctor at 9:30. The wait turned out to be entertaining. One women was curled up on the floor with a barf bag in her hand. Every ten minutes she’d sit up, clear her throat, and hock loogies into the bag. I felt bad for her as she was the only patient in the waiting area who appeared near death. She was in such bad shape that two other patients approached admitting to see if she could be seen by the next doctor. An elderly couple entered urgent care about fifteen minutes after I arrived. The husband helped his spouse get checked in, and everything seemed fine. About an hour later, the woman was called up to the front desk. The mysterious LCD screen showed that something was wrong with her insurance. And that’s when I learned the only thing worse than trying to see a doctor while self-employed is trying to see a doctor when something isn’t quite right with your insurance. The woman working admitting told the couple they would need to resolve the problem because she was busy and didn’t have time to fix it herself. I gathered that the patient has signed up and paid for COBRA, but her paperwork had not been entered into the computer. So she’d need to pay for the services and submit receipts for reimbursement. But the busy woman at admitting wasn’t having any of that. “If you need an x-ray they may not do it because you don’t have insurance”, she told the woman. The husband pulled out his cell phone and began making calls. He finally tracked down his wife’s paperwork. Still no luck. She wouldn’t show up in the system for at least a week. Dejected, the women returned to her seat where she discussed the situation with her husband. The woman had fallen the day before and explained how much her knee and wrist was hurting. Given her age, I wouldn’t be surprised if she broke or fractured something. Nearly 90 minutes had passed since they entered urgent care. Finally, they approached admitting one last time and asked to have her name removed from the waiting list. They would call her primary physician to see what could be done. I watched as the husband held his wife’s arm and slowly walked her to the car. It’s hard not to believe that such a scenario plays itself out time and time again all over America. Every ounce of humanity has been stripped out of the process of seeing a doctor today. The waiting room is covered in signs warning everyone what not to do. Don’t use cell phones. No service without ID. No immunizations. Don’t ask to use the phone. No changing channels or increasing the volume on the TV. Just sit there and shut up till your name is called, OK? I wanted to run after this couple and apologize for how they were treated. It made me sick to my stomach. Can you imagine your parents or your grandparents being treated in that manner? The system is broken when our neighbors are being turned away for care they critically need. We should demand better than this.